Block and unlimited passes are non-refundable and non-transferable. Block Passes provide you with a certain number of classes to be used within a specified timeframe and are strictly valid for the period indicated on your pass issued at the time of purchase. Passes are not extended for any reason whether that be due to missed classes, illness, holidays etc and as a result you are encouraged to use your classes prior to the expiry date. These offers apply to new Moksha students only. 1 Month Unlimited Intro Pass is also valid for new students immediately after using their 14 day Intro Pass. Intro Passes include all Power Flow, Beginners Yoga, Yin Yoga, Slow Flow, Gentle Flow and Pre-Natal Yoga Classes as well as Meditation & Mindfulness Classes. The Intro Pass does not include access to short courses or special events – these can be purchased separately. Registration and payment is required prior to course commencement to guarantee your place and payment in part or full confirms your place on a class, course or program and is therefore strictly non-refundable and non-transferable. In special circumstances if you are unable to attend the course/program for which you have booked we may offer a transfer or a credit note, at our discretion. Credit notes are not issued after course/program commencement. If in any event you miss a session you are able to attend the same missed session in the next beginners/meditation course subject to availability. For all other enrolments, in the event that you miss a single/multiple session/s, you are welcome to attend a public yoga class according to our current schedule. All courses/workshops will run where there is a minimum of 8 students 48 hours prior to course/workshop commencement. Should the minimum number not be reached, those registrants will be contacted and their course/workshop re-scheduled to a mutually agreed date or Moksha Yoga will refund 100% of the course fees received. Registration and payment is required prior to intensive/workshop commencement to guarantee your place and payment in part or full confirms your place and is therefore strictly non-refundable and non-transferable. In special circumstances if you are unable to attend the course/program for which you have booked we may offer a transfer or a credit note, at our discretion. Credit notes are not issued after course/program commencement. Gift Vouchers can be used for any product or service that Moksha provide and are non-refundable. Where there is already a discount, no further discount can be applied. If promotions are offered, they are to be used strictly within the advertised time frame. 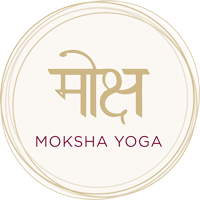 Moksha Yoga will only collect and store information about you that is necessary to assist us in responding to your enquiry, request or comments.